The Minnesota Jewish Theatre Company's Our Class is not an easy play to see. It's not the kind of show you go to for a light escape from reality for a few hours. You walk out of the theater with lots to think about, and none of it very happy. But it's important to remember our past and attempt to make sense of it, although I'm not sure one can make sense of the atrocities committed against friends, neighbors, classmates as in this play. But at least we can bear witness to it. 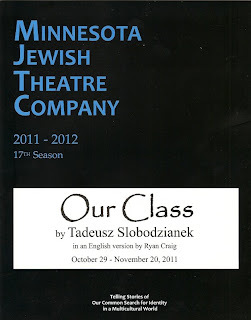 Our Class was written by Polish playwright Tadeusz Slobodzianek based on true events in a small Polish town during WWII. The 2001 controversial book Neighbors argues that the majority of the Jews in the town of Jedwabne were murdered by the Polish residents of the town, their friends and neighbors, not the Nazis. The play explores this idea and examines how children who once played, laughed, and learned together can grow up to betray and murder each other. The play begins with ten young classmates, played by actors of various ages (corresponding approximately to the age of their character at the time of death). They're normal school-children, laughing, playing, teasing, fighting. As they grow older a division begins to be apparent between the five Jewish children and the five Catholic children. The division grows as the war progresses and Poland is invaded first by the Soviets and then by the Nazis (to simplify the incredibly complicated history). Classmates turn on each other, betray each other, beat each other, but some choose to shelter and save each other. Act I culminates in the burning of a barn containing hundreds of Jews. Some of our class are the perpetrators, some are the victims. In Act II, those that are still alive try to move on and make a life for themselves. Some feel remorse for what they've done, others feel justified in their actions or are in denial of them. Either way, the events of that day remain with them forever. As each character dies (the play follows each character to the end of his or her life, whether young or old, in Poland or elsewhere), one signature article of clothing is replaced with a version in red - a belt, hat, ribbon, vest. And they remain on stage; ghosts haunting the lives of those left behind. An interesting feature of this play is that characters describe their actions as they're doing them (which reminded me of the style of In the Red and Brown Water). This gives the audience deeper insight into each character's thoughts and feelings. Some of the characters are based on real people, and all of them are fully defined. We get to know specific details of each character's life, some that don't even really relate to the plot, but all of which help to create a sense that these are real people. The cast is so talented in bringing these characters to life that I hesitate to call any of them out because there are so many powerful performances. But I will. :) Elena Giannetti is the young wife and mother Dora; strong and heart-breaking, she's the center of the two most painful scenes of the play. Caleb Carlson (graduate of the U of M/Guthrie training program) is the militant Rysiek who commits some pretty atrocious acts, but Caleb manages to convey Rysiek's inner torment that makes him almost sympathetic. As opposed to the completely unlikable Zygmunt (Michael Jurenek), who betrays both "friends" and "enemies" alike depending on what best serves his own self-interest. Candace Barrett Birk is the Jewish girl Rachelka who becomes the Catholic woman Marianna in order to survive, and lives out her life resigned to her fate. Maggie Bearmon Pistner (who was so funny and over-the-top in Next Fall at the Jungle earlier this year) is Zocha, one of the "heroic" Poles who harbored and saved a Jew, which comes with its own complications. One of the wonderful things about this play is that each character reacts differently to the situation they find themselves in, showcasing a wide variety of what people did to survive, some admirable, some not so. I wanted to see this play for several reasons. I am of mostly German descent, except for my one Polish great-grandmother, and was raised Catholic, so I feel like it's part of my cultural history that I need to be aware of and deal with, as difficult as that is. I have traveled in Germany and Poland and visited the concentration camp at Auschwitz. To say it's a sobering experience is an understatement. Seeing this play is a little like visiting Auschwitz (without the very visceral sense of being in that place), difficult but somehow necessary. At intermission I overheard several conversations about people's personal stories about the holocaust or what their parents told them about it. This play gets people talking and thinking about difficult issues, which is what theater at its best is all about.